The Casio PX160 is equipped with an Acoustic and Intelligent Resonator (AiR), which is Casio’s latest multi-dimensional sound production system. This processor allows the PX160 to deliver the sound of a 9-foot concert grand at 4 dynamic levels, with seamless dynamics and remarkable sound quality. It even simulates the Damper resonance to provide that wholesome and realistic sound, when the dampers are raised by the pedal. The result is a stunning and one of the finest reproduction of acoustic grand piano music. Casio’s latest keyboard mechanism, with the innovative Tri-Sensor technology provides that delicate feel and incredible sound whenever you play the keyboard. 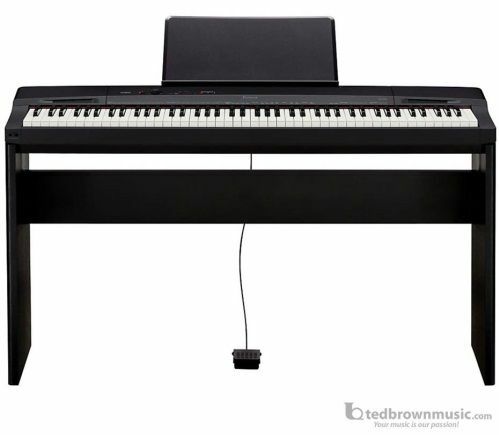 New simulated ebony and ivory textured keys, are equipped with three sensors that detect the intensity with which each of the keys are struck, and then reproduce the grand piano sound with the same dynamics and accuracy. Casio’s proprietary Hammer Action feature matches the speed of the PX160 key action with that of the hammers that move inside an acoustic grand piano, which provides the ultimate key-to-sound experience that is unmatched by the key actions of other brands.